What is DigitalOcto and Why Use it? – Grow your audience with real and active followers who are willing to engage with the content you are sharing with them. When running a social media presence, sooner or later you feel stuck. Stuck with finding ideas what to post. Start researching, reading a lot of posts, most of which repeating the same information over and over… After spending a while, you are back to the beginning still having no clue what to post. Sounds familiar? DigitalOcto is designed to help small business owners, startups and marketers to find great visual ideas based around current social media trends, events and holidays. Do you know that certain kinds of posts work better than others? Research shows that compelling visual posts provoke the best engagement rate (likes, followers, shares, etc.) and customer response. This leads to more customer loyalty, new leads and stronger customer advocacy. We at DigitalOcto believe that big companies with huge marketing budgets and expensive teams of digital content creators and designers shouldn’t be the only ones who get to ‘win’ at social media. That’s why we created our platform to help small businesses start doing social media faster and smarter, and get the best results from their efforts. 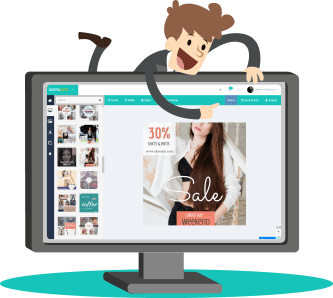 With our easy-to-use Image Editor Tool, you can edit and customize more than 1500 post design templates – changing pretty much everything – from fonts and images to colors; add your logo and more; or just start from scratch. Once you are ready, you can share the post immediately on Facebook, Twitter and Pinterest (LinkedIn is coming soon), or schedule it to go live later with our SmartPublisher tool. And the third important ingredient of social media success with the biggest marketing impact on any business, is the ability to attract only active and targeted followers and fans who will engage with the content you are sharing with them. This is where SocialGrowth comes in handy. It helps make meaningful connections and get real and active users fast. And all these tools are available in a single platform. Do not waste any more time, become a pro today!